Full marks are due to the Guildhall School of Music and Drama for choosing two unjustly neglected masterpieces for their opera double-bill. According to the listing of Donizetti’s operas in the New Grove Dictionary of Music, Rita was Donizetti’s seventh-to-last opera – not the sixth-to-last as stated in the programme notes for the evening. Either way, having composed some sixty operas throughout his life, by the time of Rita (1841) Donizetti (1797-1848) was mature and experienced. Regardless of whether one regards the plot of Gustavo Vaez’s libretto as light-hearted fun or irritating nonsense, Donizetti’s music is delightful from the first note to the last, showing the great tune-smith at his best. The plot of this comic one-act opera concerns Rita whose first husband Gasparo was something of a male chauvinist, who occasionally gave a trashing to his wife to secure her obedience. Rita’s second husband Beppe represents role reversal for Rita, as she keeps him under her thumb and beats him from time to time. It turns out that the first husband has not died (as Rita thought) and that he in turn thought that Rita has died. When he turns up to obtain Rita’s death certificate (so that he could marry his new love), both of them are inconvenienced by finding the other alive. This gives a chance to second husband Beppe to free himself from Rita’s tyranny. After some arguments and cunning all round – that is, after three arias (one by each of the protagonists), two duets and one trio – the finale sees Beppe declaring his love for Rita while Gasparo is leaving the happy couple to seek his new love. Neither soprano Anna Patalong (Rita), nor baritone Victor Sicard (Gasparo) seem to have ideal voices for Donizetti – I would love to hear Patalong in Puccini (perhaps even in Wagner) while Sicard, for instance, in Verdi – but they delivered their parts with admirable professionalism as well as with a good sense of humour. With his truly bel canto voice, tenor Alberto Sousa (Beppe) was ideally cast but his technical approach to Beppe’s undoubtedly high top notes was less than helpful. Iolanta’s libretto by the composer’s brother Modest Tchaikovsky could be considered as sentimental and unrealistic. On the other hand, it may suggest practical wisdom: over-protecting love is not helpful, ignorance is not bliss and struggle may lead to victory. Based on King Renè’s Daughter by Danish poet Henrik Hertz, the plot tells the story of blind Iolanta who does not know that she is blind. Her father, the King, keeps her isolated and protected from the truth. But the maturing girl notices unexplainable mysteries – for instance, how did her nurse notice Iolanta’s tears without touching her eyes – which are revealed by a stranger (Vaudemont) who meets Iolanta more by accident than design. The knowledge of her blindness as well as her love for Vaudemont (the stranger) helps Iolanta to endure painful medical treatment which restores her sight. A mature composition by Tchaikovsky (1840-1893), Iolanta was premiered in 1892 and it contains all aspects of the composer’s mastery: beautiful melodies, clear structure and genuine passion in its many varieties. Three singers stood out as possibly ready for any of the world’s opera houses. 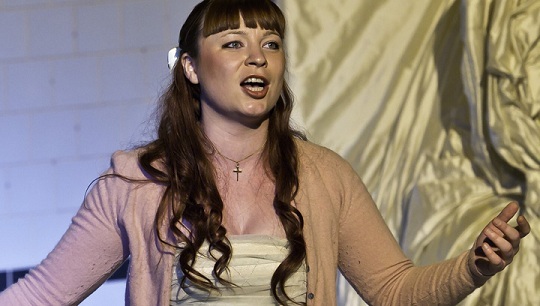 Soprano Natalya Romaniw (Iolanta) presented an extraordinary performance. Her vocal delivery contained the many nuances which are inherent in Tchaikovsky’s score while her acting as the blind girl was entirely credible and deeply moving. Bass Matthew Stiff (King Renè) and baritone Ashley Riches (the doctor, Ibn-Hakia) made me just sit back and enjoy their vocal and dramatic mastery. Tenor Paul Curievici (Vaudemont) was a last minute replacement although scheduled in the role for other performances. He is either unsuitable for the role or has not had enough support in preparation. He looked and acted the part well but his vocal contribution did not gel either with Tchaikovsky’s warmth or with the other singers around him. Stage director Martin Lloyd-Evans appears to have updated both operas but both productions seemed timeless. For my money, he has slightly overdone the grotesque in Rita but the audience around me rolled with laughter thus entertainment was ensured. However, Lloyd-Evans’ handling of the crowds was less than satisfactory. Having added some ten silent characters to Rita, I would have liked them to have a little more involvement than just sitting at the tables (apparently neither eating nor drinking), although they reacted suitably to the climax. The chorus in Iolanta (here doctors or nurses or perhaps sailors; all dressed in white) was also rather static. I thought that the action in this production took place on a ship, with the heroine below deck. However, my companion for the performance thought that what I interpreted as a lower deck was actually a pool. Either way, we were surrounded by water. A somewhat clumsy (and possibly dangerous) long stepladder was used to enter and leave Iolanta’s residence. This ladder has not contributed to easier delivery of Tchaikovsky’s vocal lines (or, dare I suggest, perhaps even to health and safety? – indeed, the doctor climbing those steps in his long frock gave me palpitation for fear). I would have liked more insight from the programme notes. We had a few lines of background to Rita, full synopses for both operas and names/biographical notes for performers. Aren’t there any Guildhall students interested in music history? Or was this a question of lack of space for printing? With his well-chosen tempi, conductor Clive Timms presided over stylish and thoroughly enjoyable performances. Full marks also to the acoustics in the Silk Street Theatre: they compare favourably with those of prestigious opera houses of the capital.